If you went to see a show at the theatre where actors forgot their lines, props went missing or scenery collapsed, you'd probably ask for a refund. Their current crop of shows - including The Play That Goes Wrong and The Comedy About A Bank Robbery - are set the be joined by a new production later this year. Magic Goes Wrong has been created by Mischief together with US magicians Penn and Teller - whose fame in the magical world is perhaps second only to Harry Potter's. The collaboration came about after the famous duo stumbled across one of the Goes Wrong shows while on tour, explains Henry Lewis, Mischief Theatre's artistic director. 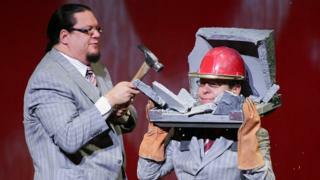 "About 18 months ago, Penn and Teller came to London to do a few shows at the Hammersmith Apollo, and while they were here they went to see The Play That Goes Wrong," he tells BBC News. "And they really enjoyed it and got in touch. We were performing in New York at the time and they said, 'Well when you finish your run, come and spend a few days with us in Vegas, meet us and see our show'." Predictably, they hit it off and soon began working together on Magic Goes Wrong, which opens in December as part of Mischief's year-long residency at the Vaudeville Theatre in Covent Garden. JJ Abrams, who is among the production team, says: "I am a nearly life-long fan of Penn and Teller and working with the Mischief Theatre Company has been pure joy." But, he joked: "I expect all that to change with this new production." Image caption Henry Lewis of Mischief Theatre is a "massive fan of magic"
The announcement of Magic Goes Wrong adds further momentum to Mischief's already-considerable success. When it first opened in the West End in 2014, The Play That Goes Wrong was a surprise hit, winning an Olivier Award and having its residency at the Duchess Theatre extended well beyond its initial run (it's still currently playing there five years later). "You get two questions on repeat as a theatre critic: 'What should I see at the moment?' and 'Have you been to The Play That Goes Wrong?'" wrote Matt Trueman in WhatsOnStage. "More than anything else in the West End, it's the one show people want to recommend. As tips go, it's a cast-iron cert: a show that transcends age, class, even language; a proper old-fashioned family show." Ironically, given their titles, the Goes Wrong shows are among the most well-rehearsed and tightly performed in theatre. They have to be, in order for everything to go wrong, on purpose, at a specific time. Which must have made entering the world of magic a particular challenge. "It's a really complicated craft, there's lots to it," acknowledges Lewis. "I've been a massive fan of magic since forever. I had a childhood obsession with it, so it's been amazing and fascinating to find out about some of the methods; like the psychological element and how to make things more deceptive." He adds: "What we really want is for this show to be funny, and obviously it's a Goes Wrong show, so some of the tricks don't work, but also there is real magic in it as well. So even if the tricks aren't quite the ones that were intended, there's lots of real genuine magic in it." The key question, of course, is whether the Mischief team were among the few people on earth to actually hear Teller's voice. As part of their own act, Penn does all the speaking during tricks, while Teller remains silent. He adopted this policy early in his career as a way to combat heckling, although he did memorably speak as part of a gag on a special episode on The Big Bang Theory last year. "I have heard his voice, he spoke a lot during the process - but don't tell anyone that!" Lewis jokes. "He was full of great ideas, and really is a magic expert." Luckily, Teller actually broke his silence to tell journalists: "When our own magic has gone wrong, we were miserable, but when it's somebody else, it's hilarious, so this seems like the perfect project for Mischief and us. "Any idea we'd pitch Mischief, right on the spot they'd turn it around and make us double over laughing. We're very proud of the results."